Page 165 of 165 Official ACR Thread Register or Use the arrow to the right to read the other 164 page(s). Bot infested site - want my business back, ban at least 100 bots and sue someone! That is an interesting new development. ACR reimbursed over 4400 players to the tune of $175K. If you click on the "more info" link, you can see the complete list. Bots tend to stick to the higher cash tables. That particular bot (FoxRox from Latvia) only affected the upper 1.3% of ACR users --- very high rollers. @Cody5991: I believe you need to make a new account for the v2 client while it is in beta since it is play money only. While the average does not seem like a lot, look at the top of the list where they were bilked out hundreds of dollars. Then you have to factor in the hundreds of people who may have just had one run in with this particular bot. The average does not mean a thing. The key number is the player percentage which is 1.3%. This bot operated at tables that did not affect the majority of players at ACR. On the lower left hand corner there is the little stat summary button, I've seen this blank out during times when my machine seemed overworked (although I can't imagine the problem lying anywhere besides the software) by multiple tables/apps even though I've never had the lobby fail to open? If it's really bugging me or making me think I'm hacked I'll close everything and reboot. This always fixes the problem I had? Weird.. I've noticed that any time my lobbies wont open, closing and reopening ACR always fixes the problem. Can still get annoying and I'm not sure what causes this to happen. Lately when I have started more than two tournaments on ACR, the lobbies won't open and I'm stuck playing a tournament without knowing how many people are left, the average stack, etc... Anybody else have this problem and know how to fix it? Yes, once again I am forced to deal with a problem that only happens on ACR, lost power during a game, when I logged back on, my account was already in use? WTF. Do you have power backup for your modem? Sounds like it kept your connection alive while the power was out. If it happens again, unplug the modem, wait 10 seconds and power it back up. This thread is for answering any of your questions or concerns, so feel free to ask and I will be more than glad to assist you. As the ACR Rep, my goal will be to make sure your opinions and feedback are heard by those making the decisions and help make sure your experience at America's Cardroom is a good one. I just won a ticket today abiut an hour ago to Step 2 of the Venom, but it states that it expires 4/14/19 which is today. Im the only 1 registered for the Step 2, if midnight hits and thebdate changes to 4/15/19 will my ticket expire? I only won it hours ago. You can send your report here at support@americascardroom.eu with the Hand IDs or the tournament IDs so our Security department can check them. Hello, you should create a new account so you can test it out. By any chance do you play in other computers? Dude, It isn't the players' responsibility to police the site, it is ACR's job to have a fair and balanced game. As you may noticed, we have the first and only transparent & verifiable reimbursement policy. Our security team works every day in order to have a safe environment, however if you need to re check any hand history, you should send it to the email I previously provided. That is the worst thing I have ever heard in all honesty...Nothing against you personally but this is what your answer says to me...yeah are product is not ready and vs fixing it ourselves you should go out of your way to create another account. I get it is in beta but I wont be creating another account so when elementary issues are fixed let me know and I will for sure give the new client a spin. Noticed that due to is a Beta version, you will be playing for play money, not real money. Good job on the second player now listed. Just go ahead and ban the entire country of Latvia - seriously. You do realize bots are not inclusive to just ACR, right? At least ACR is refunding players for it. They are late in the game here. I am glad they are starting to take action. Is there anyway i can get a screenshot of the cash finishes I had in the $10 freerolls. I wanted to get ranked on CardsChat and have it apply here. I did not know I needed a screenshot of the finish?" Is there anyway my name on there is : TravelerLloyd and I had two cash finishes, one was a 2nd place finish and the other wa like 7th or 8th. From now on I will try to take a screenshot of the finish, bu I dont really know how to do that but can try. Just curious if tournaments and cash games are going mobile any time soon? Yes same for me. Came here to see if it happened to anyone else. Just completely disconnected me from server. I restarted it and it's up and running now. Actually I'm pretty tried of watching the same old players at every table I play on winning every hand they play,programmed poker is fixed. Always remember that these poker sites are designed to make money,not let us build. 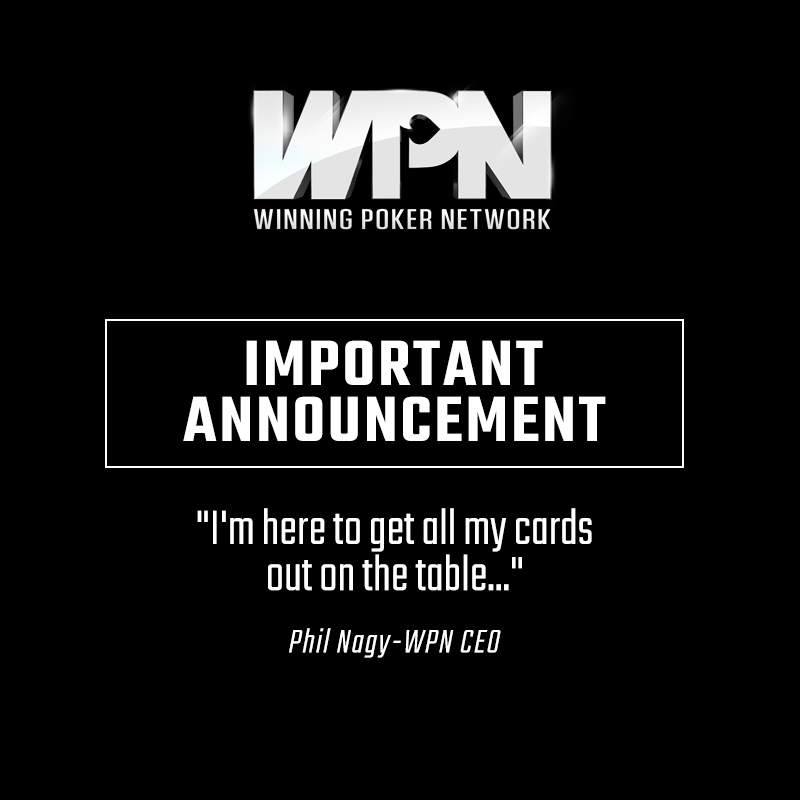 Just say no to WPN,if you want to play poker and actually cash some good money,go to a casino. Just shut down ACR & restarted the poker client. Everything seems to be working again. My win was registered. All is ok again. Why bother you turn your backs to it anyway. Nothing ever gets done or else there wouldn't be so much BS still going on all over that site. And Russia,Israel,Iran,Bulgeria,Ukraine,Lithuania and don't forget about that kakasstan or whatever its called. All bogus. Our department in charge is still working on it. Soon as possible we release more details about it! Make sure to keep following this thread and also our Social Media Channels so you can't lose it. Head to https://www.americascardroom.eu/online-poker-promotions/high-five-tournament-series/ now for more details. Our CEO, Phil Nagy has released a video statement discussing the new verifiable and transparent bot policy. ACR Rep; What is up with this bug??? I have my options set to not show double up option when I win money. Only problem is my setting is being ignored. I know there are many bugs individuals are experiencing. Maybe add this to the list to someday work on? I would like to know how you choose to block visa options for deposits. I have just started using your site and would like to give it a go. It does have some bugs but I really like that it hosts some satellites that are not quite as turbo charged on other sites and with good payout structures. I tried depositing with visa debit card, it stated transaction blocked. I tired a couple of times and then another card a couple of times and then suddenly I was told all my visa options had been removed and you could not tell me why for privacy reasons (although they are my cards) but you were happy for me to use crypto currency. I am based in the UK and some others on the forum have said you do not accept Visa (even though the option was initially there). However I also do not have the ewallet options available either so my only option is Cryto currency. While this is something I can look into I have never used it before and there are different security levels associated with different types of wallets and various other factors. I do not know if it is better to take the money straight back out after depositing in the wallet so you are not affected by fluctuations but I am not sure why I have had all visa options removed. The representative was quite polite and friendly and sent me a video on crypto currencies but this was extremely basic and did not really go into it that much. But because no reason was given for removing the Visa option it makes me worry if I have another issue with another payment method. Are some countries blocked from Visa and is there a reason to block ewallets? It seems generally people can deposit through Neteller etc but I do not have the option. Maybe it is time I need to look at Crypto currencies but I also feel I am being forced to play on your site. I would like to give your site more of a go and I will try and look Crypto currencies but I would really like to know the reason I have had these options removed or why there would be a privacy issue telling me why this was removed as a payment option for me for my own cards? On a separate note I would love to know how the double or nothing works in the post above mine, have not seen this before. To double to you simply need to place? Obviously the amount you receive initially in a tournament is based on your exact placing. If this is explained on the site excuse my ignorance. 8 more, that's 10 total. Please hit the cash guys too. I love you guys for doing that, you are my number one recommended Online Poker Room. Americas CardRoom you now have earned my respect. Great job and I will play at your site whenever I can if possible you are the best! Standing Up For The Little Guy!!!!! I think the public openness about bots is very good and do not understand why it puts some off a site. I would much rather a site does what PartyPoker and ACR are doing. At least you know they are doing something and being transparent about it. Page 165 of 165 Register or Use the arrow to the right to read the other 164 page(s).